Even if you have never been to Japan, you must have seen images of chozubachi, tsukubai and tetsubachi. The water basins, hewn from a rough stone with maple leaves or cherry blossom petals floating on top of the water. Often the water reflects the sky and surrounding greenery. You will also find a bamboo water dipper or laddle and rest lying across it. A chozubachi is a small water basin provided in Japanese Buddhist temples for visitors to purify themselves by the ritual washing of hands and rinsing of the mouth. This type of ritual cleansing is also the custom for guests attending a tea ceremony. 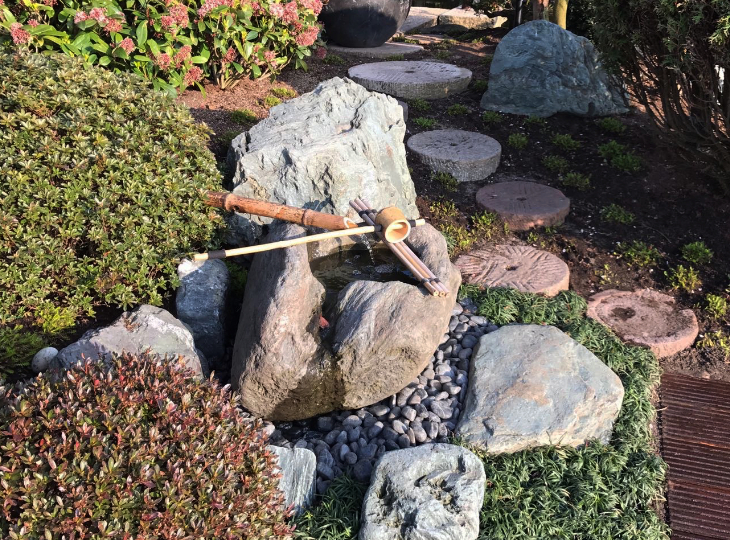 Another well known Japanese water basin is the tsukubai, an important feature of the Japanese tea ceremony found within the yard surrounding the tea house. Universally the tsukubai and chozubachi are associated with the Japanese garden. Placed near the veranda of a traditional Japanese house or outside the tea pavilion, it would be hard to miss this element of Japanese beauty. Outside the entrance of a Japanese Shinto shrine, especially if it adjoins a wedding hall we also will find a tsukubai or tetsubachi. Participants must pour water over their hands and rinse out their mouths, even if they have already done so at the main fountain standing on the shrine compound. Within the grounds of Japanese Buddhist temples we find many elements of Shinto origin, the chozubachi being one of them. No Zen temple garden would ever be without one. There is one very famous tsukubai that can be found at the Ryoan-ji temple complex, this water basin is famous for the inscribed poem. The kanji written on the surface of the stone reads "What one has is all one needs", and is meant to reinforce the basic anti materialistic teachings of Buddhism. Yokoso Japanese Gardens offers exact granite replicas of this particulair tsukubai. Please be advised Yokoso Japanese Gardens can also assist in the search for, purchase or lease of authentic antique Japanse chozubachi, tsukubai, tetsubachi and granite ornaments for you. Products that you won't be able to find on our website can, most likely, be ordered. Please use our contact form. Provide a clear description of the desired product and a reference to a picture on the internet and we will try to find the product for you.